Regina First Aid has been providing first aid and CPR renewal / re-cert courses in Regina since 2008. It’s the most well-known and largest St Mark James renewal provider within the region. A large number of courses are offered at a number of different times and dates throughout the week. Signing up is very quick and hassle-free, with all expenses paid in full during enrolment so students don’t have to worry about fees while training. The Regina First aid website (click here) has a complete list of available classes, schedules, and rates. Information on instructors for special events are also available on the site. Completing a tube sling to immobilize an injured upper extremity. Courses are held throughout the week, even during the evenings and weekends for popular classes and topics. Standard first aid programs run for 18 hours long while renewal / re-certification classes are 8 hours. 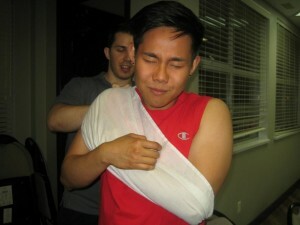 The first aid curriculum is focused on skill building on topics such as wound care and bandaging. 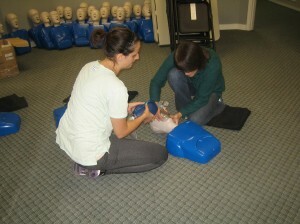 CPR and AED training is included in the full program but CPR-only classes are also available. There are three training levels (A, C, and HCP) for CPR training. A and C are for first time trainees and HCP is for health care providers. CPR level “C”, “HCP” or “A” is included in first aid recertification. Certificate cards are awarded to all students who are able to complete a program. Students can request for bigger sized certificates. These are only valid for three years, during which a student can renew them through recertification programs. The certificates will be able to meet any requirement you may need it for. Companies or big groups of trainees can opt for a private class. Instructors are also available to teach for special events like conferences. Just send an e-mail or give a call to inquire about private classes before booking an instructor. Different instructors have different rates and schedules. Regina First aid offers prospective trainees the lowest prices for all classes. Rates are inclusive of tuition, taxes, certification, registration fees, and training manuals. These are paid in full during enrolment to allow students to focus completely on training. Full refunds or reimbursements are given to students who drop out but provide a 72-hour notice. Signing up for a class can be completed through e-mail, telephone call, or in person. A registration form can also be found on the Regina First Aid website. You can enrol in any of the facilities in Regina. All facilities can be easily reached by public and private transportation. Free parking and restaurants are available nearby. Heart palpitations can be felt when experiencing arrhythmias. Arrhythmias are problems with electrical impulses in the heart. These cause irregular heart rhythms and can cause heart problems such as cardiac arrest or heart failure. 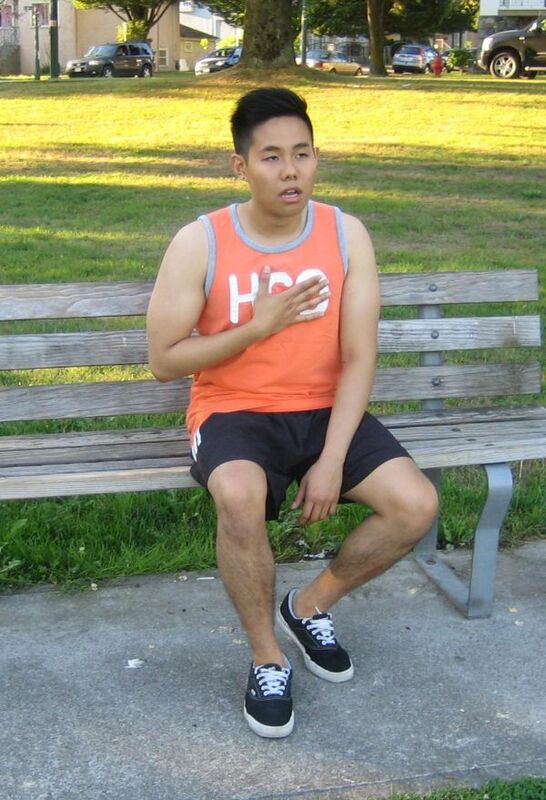 The most common symptom is palpitations, or irregular heart beats that are too fast, too slow, or both. Arrhythmias are typically harmless if the symptoms do not appear regularly but they can also be a sign of an underlying heart or electrolyte condition.